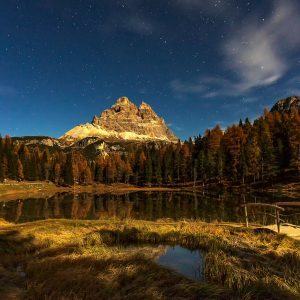 Easy / Medium / Hard – All locations within half a mile from the car, some much closer (except the couple of Tre Cime di Laveredo walks which are between 3 and 6 miles long). Some slippery rocks near waterfalls and the odd uphill section present. A very good level of fitness and mobility is required. 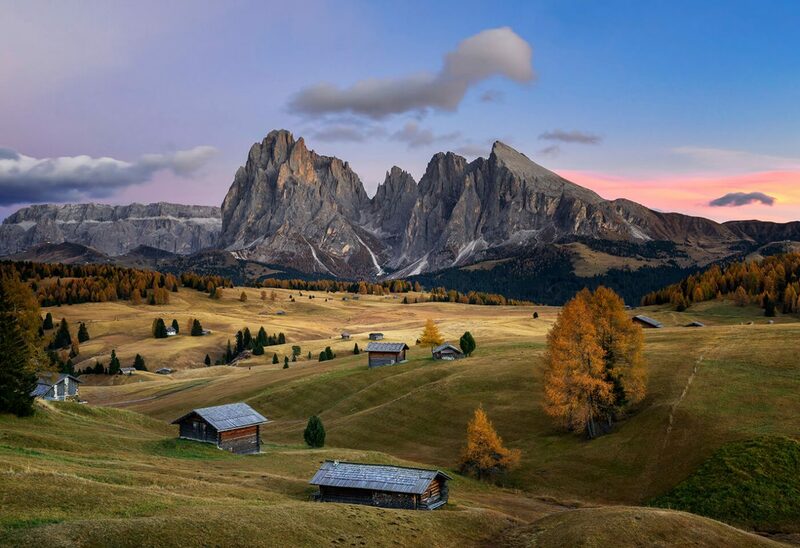 The Dolomites in Italy is a location that I have longed to visit for a number of years now. 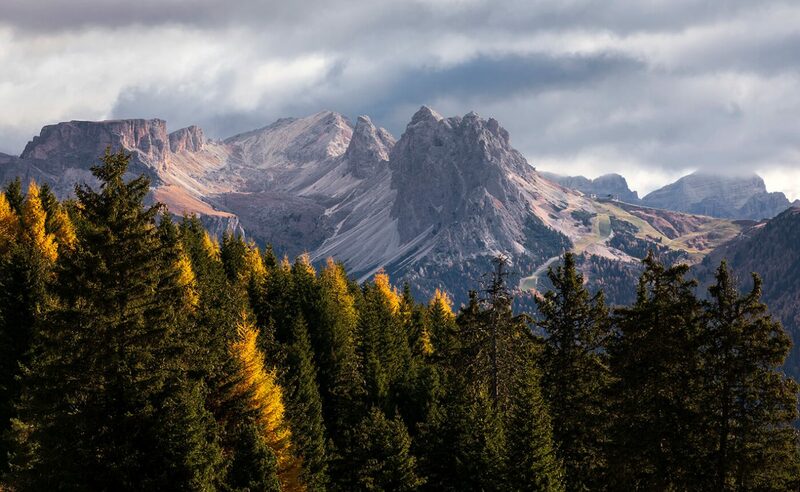 The mountains tower at almost 11,000ft over some of the most impressive and beautiful scenery in Europe. 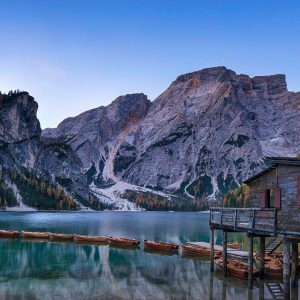 The jagged peaks, alpine hills, wooden huts and the gorgeous lakes that offer up some amazing reflections of the mountains that dominate the region. Add into the mix the stunning changing of the colours as autumn takes hold and you have a recipe for a fantastic week’s landscape photography. 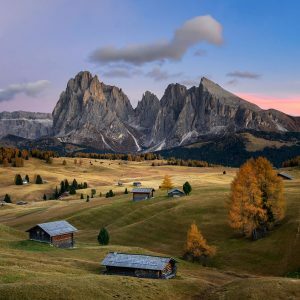 This seven day, six night landscape photography workshop is a wonderful opportunity to discover the stunning scenery of the Italian Dolomites during the changing of the colour in the height of the autumn season. 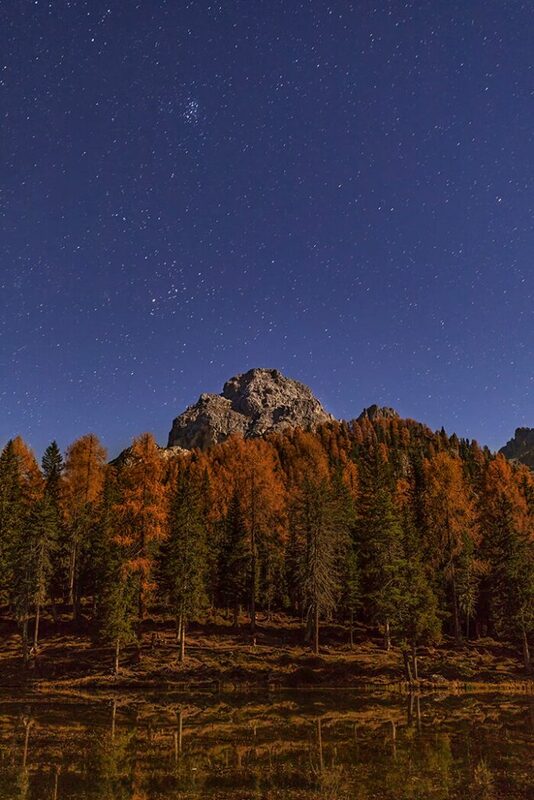 Our accommodation consists of two bases, both three nights each in Ortesei followed by Cortina d’Ampezzo. 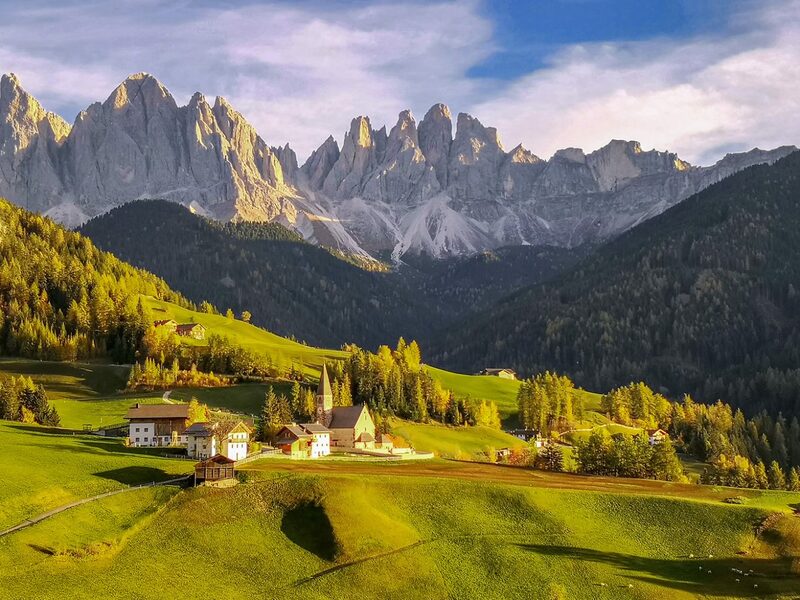 There are a total of two quality hotels during our six night stay in the Dolomites. This ensures that we are as close as possible to the locations that we will be photographing meaning less time spent travelling in the minibus. You will each have your own double en-suite room. See below for a list of the hotels we will be staying in. Click on the hotel name to be directed to their website. Here is a detailed itinerary outlining our schedule. While the itinerary looks fixed, it is really only an indication of the locations we will be visiting and the decision to alter our plans depending on the weather and light will be taken if needed. I will collect the six workshop attendees at Marco Polo Airport in Venice on the Saturday at 11am, before heading to Ortisei in the comfortable nine-seater minibus. After checking into the hotel, we will head out for a sunset shoot at St Johann Church before returning to the hotel and retiring for the evening over a good meal at the hotel. 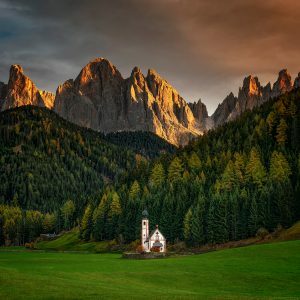 Today’s locations include a mid-morning visit to the 8,000ft high Seceda mountain range via the gondola before moving onto the Val di Funes region where the quaint small mountainside church of St Johann Church awaits us once again followed by a sunset session at the iconic Santa Maddalena Church. Day five starts with a hearty breakfast in the hotel before taking the ten minute drive to the Gondola station in Ortisei. 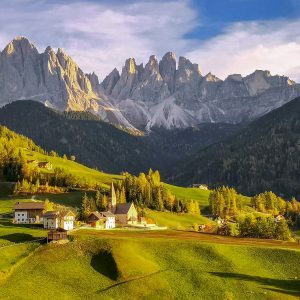 A ten-minute ride up in the gondola followed by a brief journey down into Europe’s largest high-alpine meadow, Alpe di Siusi, where we will spend the entire day wandering around at our leisure photographing the glorious sights of the rolling hills, quaint wooden huts and the dramatic backdrop the Sassolungo mountain. We will stay and capture sunset before our taxi returns us to the hotel to finish the day off with another fine dining evening at the hotel. 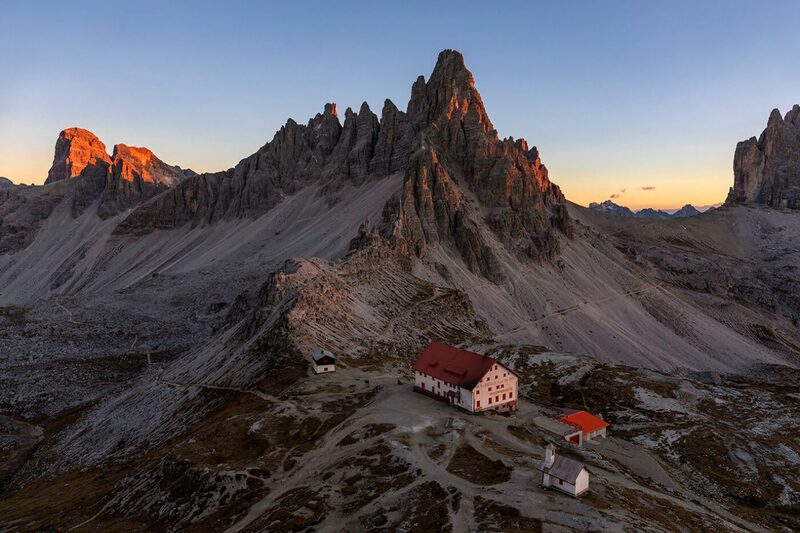 We will be up early to drive the 90 minute journey to the high mountain pass of Passo Giau where a glorious sunrise beckons (hopefully). A couple of hours enjoying the mountainous scenery as the sun rises and illuminate the peaks of Ra Gusela and the Tofane. Then onto Cortina d’Ampezzo for breakfast. 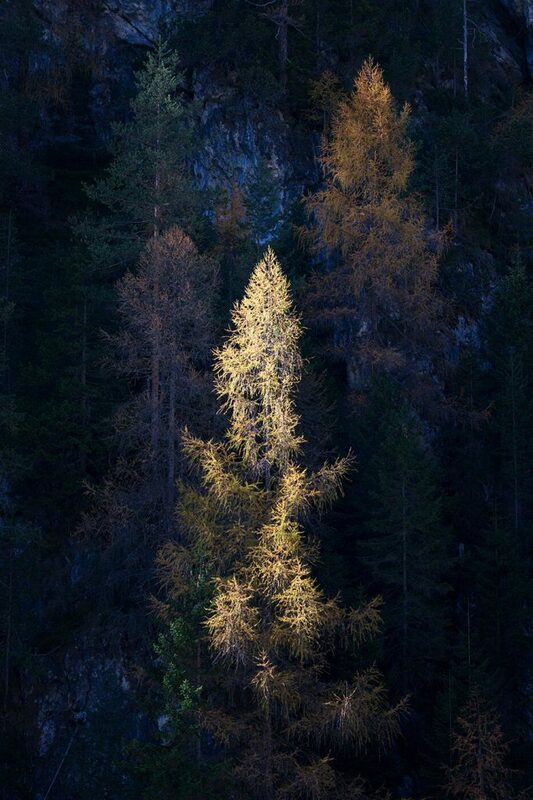 The afternoon will be spent at the waterfalls of Malga Ra Stua. 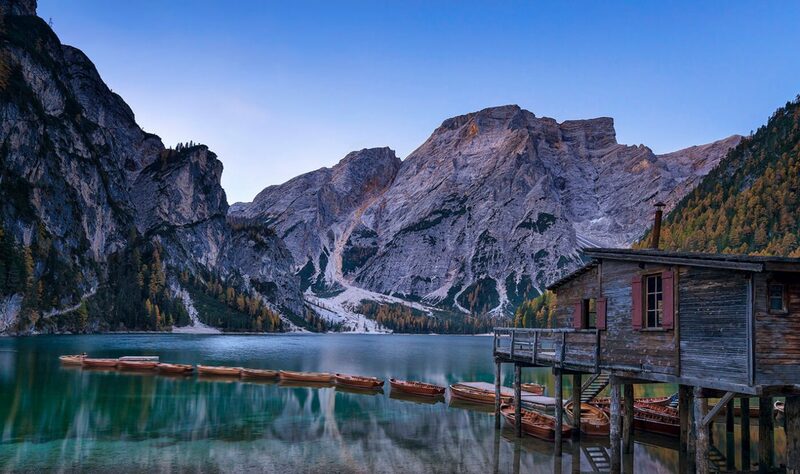 The day starts with a visit to the utterly gorgeous views of Lago di Braies, the iconic lake complete with the wooden steps down into the water and the wooden rowing boats too. Late morning we will head for lunch before spending the full afternoon taking in the outstanding and breath-taking views of the Tre Cime di Lavaredo as we embark on the six mile long track that loops around the base of the 10,000ft Lavaredo to the Rifugio Locatelli hut where sunset will be enjoyed and shot before walking back to the minibus and returning to our accommodation, stopping en-route in Misurina to eat. 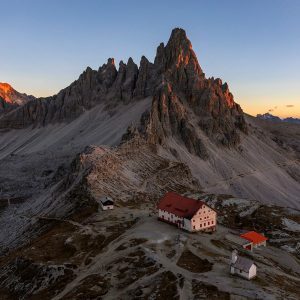 Lunch will be taken at Misurina after which the full afternoon will be spent taking in the outstanding and breathtaking views of the Tre Cime di Lavaredo as we embark on the six mile long track that loops around the base of the 10,000ft Lavaredo. Sunset will be enjoyed before walking back to the minibus and returning to our accommodation. 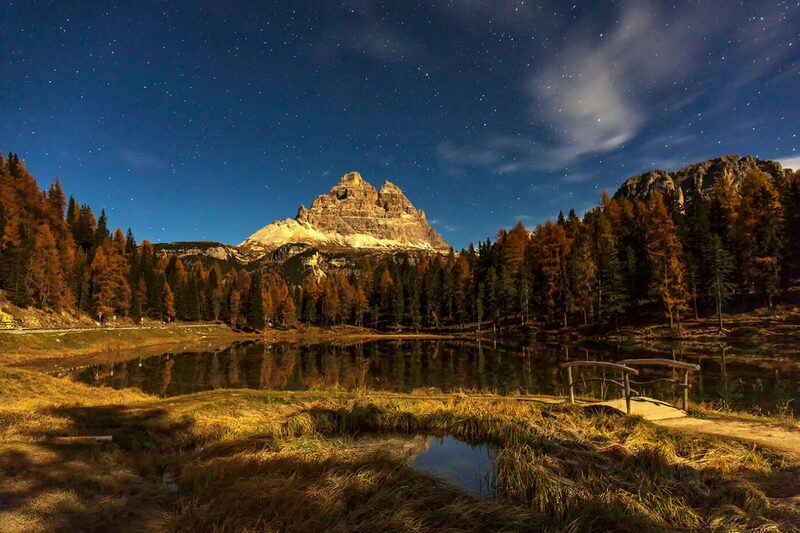 Sunrise shoot at Lago Misurina to capture the reflections of the Tre Cime peaks in the still water. Back to our accommodation for a well deserved breakfast followed by visit to Lago Antorno. 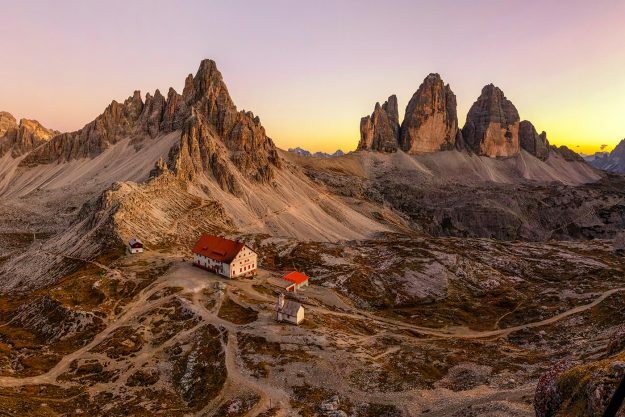 The afternoon will see us return to the Tre Cime di Lavaredo National Park to walk the shorter route to the Rifugio Malga Langalm hut and its two small lakes that reflect the peak of the Lavaredo in them. We will be taking in the sunset from the hut before walking back to the minibus and returning to our hotel restaurant. Early check out at the hotel this morning to arrive at Marco Polo Airport for 9.30am followed by the flight home to reflect on what will be a trip of a lifetime. If you have always promised yourself a photography holiday of a lifetime, this one will take some beating. I hope you can join me. Flights are not included in the workshop price. The expected cost is around £80 approx from Manchester to Marco Polo Airport in Venice including a 10kg cabin bag. Add your 22kg hold suitcase to the flight cost. Airline is Jet2.com. You can get a direct flight from Manchester to Venice airport. Full flight details below. 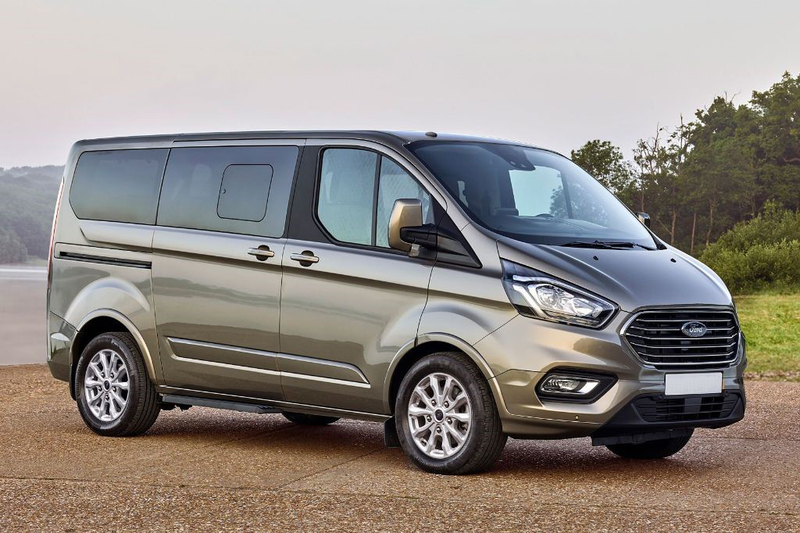 Our mode of transport for this workshop is a new nine-seater Ford Tourneo minibus hired directly from Marco Polo airport in Venice. This will ensure that there is plenty of space for us all including luggage, clothing and camera equipment. 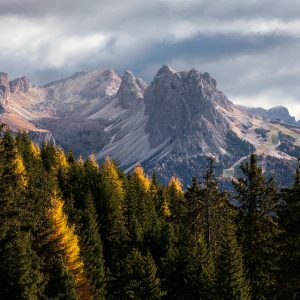 If you want some fun, adventure, fantastic scenery and great photographic opportunities then I would strongly recommend that you go on a photographic workshop/tour with Melvin Nicholson to the Dolomites. This 6 day tour had everything and Melvin’s organisation, planning and research were second to none. However he was always happy to make changes in order that we got the best out of the light and the weather. 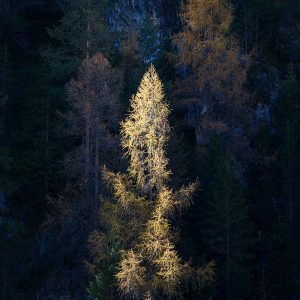 To get the most out of the location and light you needed to be up for a bit of walking and rising way before sunset: but the rewards are well worth it. I can’t recommend this tour too highly. Well Iv’e been home a week now after a week on Melvin’s Dolomite recce tour, and have started to review some of my images. Considering this was just a recce trip I have got some very pleasing images and far more than I had hoped for. Straight away I enjoyed Melvin’s sense of humor and everyone jelled into a friendly team spirited group with lots of banter. Our accommodation was always excellent as was the food and there always seemed plenty of time to enjoy my surroundings without feeling rushed or stressed. I would not hesitate to go on one of Melvin’s workshops as nothing was too much trouble for Melvin to ensure we all had a great time and were always in the best possible positions for the best light. 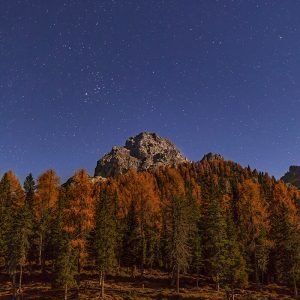 I have come away with great memories and images, the walk out to the The Dolomite’s Tre Cine Rifugio Locatelli was mind blowingly spectacular and something I will never forget.